I recently met with a start-up business here in Liverpool interested in developing a web presence. Fiona is a newly qualified personal therapist offering bespoke services to individuals and businesses. Her goal was to create a website that could function across a number of devices, in particular mobile phones. And to drive more potential clients to get in touch, establishing herself as a new player in the therapy treatments market here in Merseyside. She needed a clean design that outlined the various services on offer and a platform to explain a little bit more about herself. Fiona was keen to get some quality images created for the site, focusing on the range of treatments she offered. Also she needed the site to perform well for search engines, be easy to use and to make it really simple for people to get in touch. Finally she required the ability to review the website usage and traffic at various points in the future. So, how did I satisfy those needs and help the customer Fiona meet her goals? We met for coffee and she explained she had come to to DJC Design, via a recommendation, as we can provide both web design and commercial photography services. I've been project managing web builds now for over 20 years and this coupled with 12 years experience as a freelance photographer, meant I was in an ideal place to help her out. After learning about Fiona's business ideas, I suggested keeping things simple and starting with a one page design. Keep the essentials all in one place, with a few sections of information. 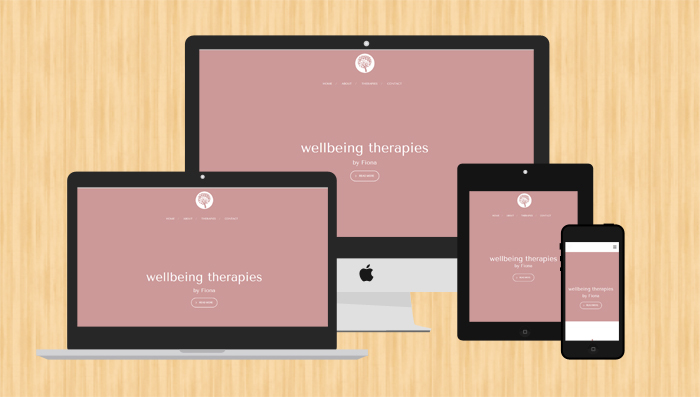 She suggested that a lot of therapist's sites were very wordy and wanted to use visuals to explain what she did. Of course additional information could be added later, but it was a good starting point. We used the old fashioned pen and paper to draw out a few boxes and sections for the site. This gave us a starting point in terms of development for me, and an idea for her of what to write for the content. After a week or so, we had a follow up meeting and I presented a few web design concepts. Fiona at this stage asked me to develop some branding for her business - which was great ! She had approached a couple of Liverpool design agencies and was shocked at their prices. I came back to her with an affordable package, including a logo design, business cards and a series of images set to the correct size and ready to go for social media - avatars, profile pictures and all important cover photos. Finally, we planned out the photography she needed and checked diaries to plan a photo shoot with her and a visiting client. So the day of the shoot came around and it was really fun. Fiona's client was fantastic and didn't mind being surrounded by backdrops and lights - then again she was getting some free treatments! We covered all of the treatments on offer and had time for some portraits of Fiona in a variety of clothes for both the site and places like LinkedIn. Next up was the web build itself. I recommended Wordpress as the content management system (CMS) as it is user friendly and Fiona wanted to be hands-on, when it came to updating the site in the future. So following on from decisions made at the concept stage, it was a case of slotting in the text and sizing the images from the shoot. Of course, we had several revisions and a few changes along the way but these were quite easy to do remotely. And we only had to meet one final time to double check everything and launch the site. Finally I set in place on the site Google Analytics code, so we could monitor traffic and at some point in the future review the site. "Thanks for doing such a great job in designing and launching my new website. You made it easy for me and very affordable. You really improved the personal feel of my website by providing me with your expertise as a professional photographer. You made myself and my client feel at ease and I think the photo's you took have really improved the look of my website. I look forward to working with you again in a few months time to review the website analytics. I will be recommending you to my fellow small business owners. Thanks again David"
So if you are looking for a qualified Liverpool therapist offering a variety of wellbeing therapies visit Fiona's site. If instead you've arrived here looking for a new website, or perhaps to refresh an existing one, please get in touch and lets hook up for coffee - I'm paying!